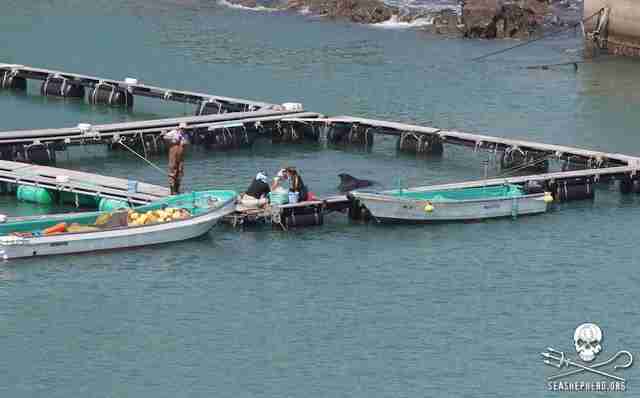 The first whales destined for captivity in a marine park this season were just captured in the cove in Taiji, Japan. Over 40 animals have already been slaughtered by fishermen this season, but two pilot whales and one Risso's dolphin are now destined for a life in a captivity. Over the past weekend, a pod of short-finned pilot whales was herded into fishing nets and kept overnight. While 15 of them were slaughtered for their meat, two juveniles were taken captive into holding pools near the shore. 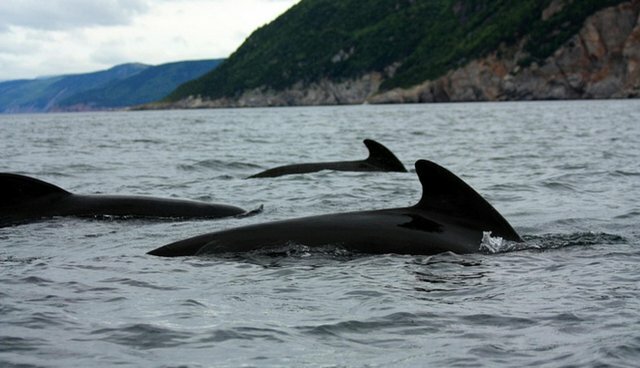 Activists from the Sea Shepherd Conservation Society who are documenting the annual drive hunt from the shore told The Dodo that though about eight pilot whales were released from the hunt, they were weak after being held without food, and one was even seen tangled in fishing nets. 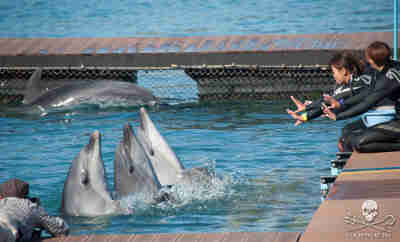 Back in the cove, activists took photographs of local dolphin and whale trainers force-feeding and medicating one of the pilot whales in his enclosures. This year, actress Shannen Doherty, a longtime animal activist, headed to Taiji to see the drive for herself and to livestream the hunt from inside the Taiji Whale Museum. "I sit at home and I watch the live streams from Sea Shepherd and I thought that I was prepared, and there is absolutely nothing that can prepare you because you're here and there's an eeriness to it," Doherty said. "Especially after they've been slaughtered - the lapping of the water, the dead calm, people start walking away. It's eerie." There may be good news, however - at this same time during last year's hunt, over 30 dolphins had been taken captive in Taiji. Activists hope that this year's three captives reflects a decrease in the number that will be taken throughout the hunt. See this map for marine parks that support the slaughter in Taiji by buying dolphins from it, and this post for what you can do to help.